December's massacre of striking oilfield workers in the city of Zhanaozen caused few ripples in the international community, unwilling to challenge a strategic partner with such abundant oil resources. 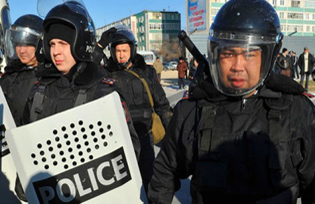 The response of the new Kazakh government has been to crack down on the opposition. The new government of Kazakhstan, albeit rather similar to the previous one, has been sworn in uneventfully, following the announcement of the results of parliamentary elections held on 15 January. The Prime Minister is once again Karim Massimov, who has led the government since 2007. Many ministers have kept their portfolios, and even the government’s style appears unchanged, based as it is on self-aggrandisement and smug complacency. So it is difficult to understand why President Nursultan Nazarbayev (who in turn has held power uninterruptedly for more than twenty years, since even before the country obtained its independence) should describe these latest elections as: “A great step forward in the modernization of the country”. Perhaps the president was referring to the fact that these elections saw the ingress of two other parties, apart from his own, into the Majilis, the Kazakh parliament – meaning that his party is no longer the only party represented there. But the Majilis had previously included other parties prior to the 2007 elections, so this is really just a return to the past rather than modernization. Or perhaps Nazarbayev was trying to say that Kazakhstan is functioning so well as a country that the electoral results now coincide exactly with the hopes he expressed just prior to the elections (he said that he hoped two other parties would be included in parliament). So perhaps next time there won’t be any need to actually vote! The president will merely have to pronounce and the political institutions will be automatically renewed without having to bother citizens with details like elections. Irony aside, the truth is that contrary to Nazarbayev’s claim, Kazakhstan’s political system appears to be in a complete state of paralysis and incapable of adjusting to an increasingly fluid situation. Massimov’s inaugural address on 18 January did not contain the slightest hint of self-criticism, not even when he referred to – he could not have avoided mentioning it – the massacre of striking oil industry workers that had taken place a month previously at the hands of the police in the city of Zhanaozen. The massacre “caused us pain”, said the prime minister, adding that the responsibility for the killings should be attributed to mysterious “external elements” who are currently being investigated. This immediately offered the powers-that-be a wonderful excuse to make life difficult for opposition politicians. In fact three days later a series of searches and confiscations took place in the homes of the leaders of an un-registered political party, Alga. Representing a group of moderates, Alga had united with some other parties of differing ideological hues under the banner of the United Front, which had not been allowed to participate in the elections. The Alga members under investigation are said to be guilty of having gone to Zhanaozen in the days following the massacre claiming that the police were the prime culprits in the killings. This was enough for them to be accused of “inciting hatred”, despite the fact that accounts of the massacre given by Zhanaozen locals all told pretty much the same story, backing up Alga’s claim. In the western region of Mangystau, where the oil industry is the major source of employment, oil industry workers had been in ferment for many months, demanding improvements in their wages and working conditions. From June 2011 onwards, a permanent protest had been held in the city’s main square by the workers and trade unionists who had been fired for having gone on strike. It was a determined yet absolutely peaceful protest, with tents, banners and placards. Other workers and local citizens would drop by bringing material help and offering solidarity. Even on that dramatic day of 16 December, the protesters in the square did not appear to be particularly tense. Events were triggered unexpectedly by the arrival of a group of thugs wearing jackets sporting the logo of one of the oil companies working in the region. Armed with clubs, they smashed up a nearby stage being set up for Independence Day festivities. This gave the green light to the police, who responded with savage violence, shooting to kill at the backs of the fleeing protestors. The square became the scene of a bloody massacre: eye-witness accounts and film clips taken with mobile phones all attest to bodies lying on the ground, injured by gunshot wounds, being beaten to death or being shot in the back of the neck. Hundreds of people were arrested, many of whom have not been heard from since. The city morgue, piled high with bodies, was secretly cleared and according to the authorities the number of victims was a mere 16. However, about one hundred people are still missing, most of whom are presumed dead. The regime – in this case President Nazarbayev in person – ordered an inquiry into the events: but the only two actions undertaken by the government (that of Massimov pre-elections) were the announcement of a state of emergency and the imposition of a curfew in the entire region of Mangystau. Thousands of troops were deployed to patrol the streets and squares of the main cities and an attempt was made to transfer the protesting workers to more distant regions by offering them different jobs. But it seems that the workers in Mangystau do not intend to give in that easily. They have refused to be transferred (also because the new jobs offered lower wages) and have remained mobilized, continuing the protests in their home towns. In some cases they have taken tough action against the government’s repressive measures, like the cutting of the railway lines which are used to transport army troops. It is no coincidence that the curfew is still being imposed in the region a month-and-a-half after the “painful episode” and it does not look like the Massimov government has any new cards to play. The problem is a very serious one, given that the oil and gas being extracted in the desolate region of Mangystau and along the marshy banks of the Caspian Sea constitute Kazakhstan’s main source of revenue. It is here that numerous national and international companies are involved in the drilling and extraction business. For many years everything had been going smoothly; the workers were used to receiving low salaries and working in very poor conditions without complaining. The companies involved earned spectacular profits, and even though a portion ended up in the treasury of the Kazakh government and in the pockets of local power brokers, they were quite happy with the arrangement and Nazarbayev’s regime was earning spectacular amounts of money. But as an increasing number of city-dwelling Kazakhs began to show off their newly-gained wealth, the oil workers began to ask for better treatment. And that is when the trouble started. Even though the government is now making every effort to say that the region is back to normal – and even though the oil companies have confirmed that, despite all the troubles, 2011 will not register any fall in production or (heaven forbid!) any down-time – it is clear that if the workers do not cave in, the problem will begin to rear its head in the boardrooms of London, Dallas and Rome. Obviously a determined, responsible political strategy is needed, but that looks unlikely at the moment, judging by the way the elections were held and how the “new “ government and its supreme leader have begun the new legislature. The new administration looks to have adapted the famous statement made by French Foreign Minister, Horace Sebastiani, after Russian troops had crushed the Polish insurrection in 1831 – “Order reigns in Kazakhstan!”. Nor have there been any serious admonitions from the West – always ready to offer lessons in democracy – to the Central Asian petro-monarchy, which one might have expected. Admittedly the OECD observers did go as far as to say that the electoral campaign was “unbalanced” and to label as “insufficient” the standards of correctness and transparency adopted during the voting and the subsequent vote count. Some European and US media reports have said that the situation in the country is far from calm, but on the whole foreign ministries have preferred to avert their gaze from what is happening in Kazakhstan and to accept the election results at face value. At these elections, the president’s political party, Nur Otan (“Fatherland”) obtained an unlikely 81% of the votes, which in turn were cast by an equally unlikely 75% of possible voters. Two other parties, the People’s Communist Party and the liberal party Ak Zhol (both close to the president, so much so that they are considered the left and right wings of his Nur Otan party) both obtained exactly 7% of the vote, the absolute minimum necessary to take up their seats in the Majilis. This result was just what Nazarbayev had hoped for (or perhaps more accurately, ordered) just before the voting took place, so as to remove the unfortunate anomaly of a one-party parliament – the situation since 2007. All of the other real opposition parties, (including the other Communist Party, linked to the trade unions) were either outlawed or were not allowed to participate in the elections for a variety of dubious reasons. If they were allowed to participate, they were denied all forms of publicity. In short, they were denied the ability to obtain any votes and if by any chance they had done, those would probably have been lost on the way from the polling booth to the Central Electoral Office, given that there was no transparency even during the counting of the votes. All this brought no reaction at all from “democratic” governments, in just the same way that the massacre at Zhanaozen had caused hardly a ripple. Despite the fact that Kazakhstan is a member of international organisations such as the OECD and the Euro-Atlantic Partnership Council which is a part of NATO, nobody thought to formally protest to the authorities in Astana. Even news coverage from all the big media networks was limited and superficial. There was very little news about the elections and an apparent lack of will to actually go and see what was happening in Kazakhstan. It should be noted that many Russian media outlets were far more critical of events. Clearly they were keen to highlight their freedom to make judgements not only about the Kazakh regime, but also about the Russian government which supports it, as well as looking to underline the undoubted differences between Kazakhstan’s “democracy” and the imperfect “Putin-style” democracy in their own country. Lurking behind the apparent Western blindness, there is clearly the oil question, or rather anxiety about the oil companies operating in the region of Mangystau (primarily Chevron and Agip). These two companies, miraculously, have not thus far been too seriously affected either by the catastrophic social situation in the region or by the workers’ protests: their total production in 2011 did not experience a down-turn, and nor did their profits. If the price of this “stability” is the maintenance of the state of emergency and curfew, with the deployment of troops and roadblocks, then so be it. In any case the regime can always try and “cover” its repressive action with the pretext of a terrorist threat, something the West is always ready to accept. Last November there were two terrorist attacks in the region, claimed by an obscure Islamist group called “Soldiers of the Caliph” who apparently have connections with radical groups in the Russian Caucasus. The more serious of these attacks took place in the Fergana Valley, a well-known centre of radical Islam in Central Asia, and the other, which claimed no lives, took place in the city of Atyrau in Kazakhstan, where the oil refineries that process the oil from the neighbouring region of Mangystau are located. This was enough for the regime to establish a relationship between the protesting workers and Islamic terrorism. They thus felt themselves authorised to use the most violent of methods to restore order. Despite the fact that there is no evidence of a possible increase in Islamic extremism in Kazakhstan, which is still the most secular of the central Asian states, those in charge in Washington and the other Western capitals must have thought it best not to take any chances and to allow Nazarbayev a free hand. Kazakhstan is already dangerously close to Moscow’s political orbit, having joined Russia’s Customs Union and signed various political-military pacts. If Western criticism were to start irritating the Kazakhs, an alternative partner would already be very close at hand.